Okay, I'm ready for summer, well maybe not 100 degree summer days, but some nice warm days. 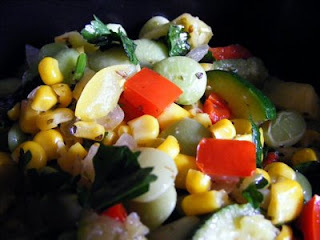 Today on Beaty’s Creek it is mighty cool, so I decided to bring summer back to Beaty’s Creek with this succotash recipe. This is a really good recipe to use your garden favorites in. Fresh is always best but right now frozen is a close second. Well this is What’s Cookin on Beaty’s Creek today. Heat oil in a large skillet add the following, onion, bell pepper, and garlic, sauté until peppers are crisp tender, about 3 minutes add corn, zucchini, yellow squash, and lima beans, sauté them until just tender, about 5 minutes. Now add marjoram and parsley. Season with salt and pepper to taste. Makes a great side dish!